What is a complete acupuncture treatment? This difficulty explains importance of use of Acupuncture Pulse Diagnosis during the treatment. Announcement of the first part states that patient may look ill, but his pulse isn't ill, in this case patient will not die; and if patient doesn't look ill, but his pulse is ill, patient will die. Obviously this difficulty explains about patient during the treatment, not healthy, but recovering or worsening. This statement clearly indicates of importance of pulse diagnosis over appearance and asks for explanation of this phenomena. Explanation states that if pulse isn't ill patient will recover, patient isn't ill. This way of recovering and being ill we look later as the answer is in another difficult issue. Key explanation is in the third most important part of difficulty 21. Some commentators even claim that this third part has no sense at all. Meanwhile it indicates that there is great knowledge. Explanation is simple and really has answer for proper diagnosis and treatment strategy. It states that patient may look ill but his pulse isn't ill, so patient isn't ill and it happens because patient's breaths are not harmonized with patient's pulse. In this case patient is recovering, but to heal him one important treatment as harmonization of breaths with pulsations should be done. 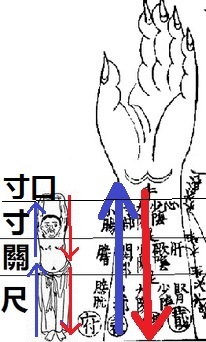 As we remember breathing cycle in classical Chinese medicine is not Pulmonary respiration cycle, but cyclical changes in 3 cuns place on the wrist as about 9 cycles (respirations) per minutes. This difficulty explains one of the most important issue of acupuncture treatment is not only normalize pulse, but also to harmonize it with respiration cycles or with 50 yin-yang cycles of 24 hours, meaning harmonize it with normal natural Qi flow. 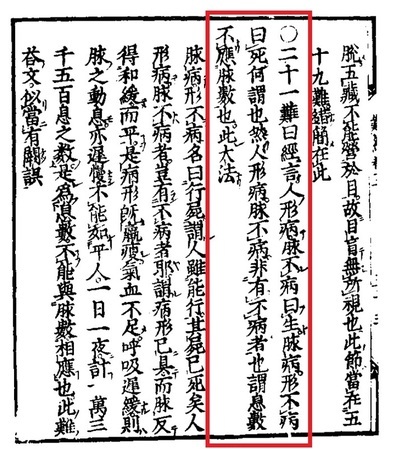 As it was said earlier in the article about how acupuncture works according to astronomical laws of qi exchanges treatment suppose to normalize condition regarding treatment of excess and deficiency of yin or yang, balancing them, but treatment should be completed by normalizing of movement of qi from the bottom of the body to the upper part through yin meridians and from the upper part to the bottom part of the body according the yin increasing and decreasing,yang increasing and decreasing, repeating yin and yang exchanges during 50 cycles and during breathing cycles. So healing process is not only balancing yin, yang, excess, deficiency but normalizing of pulse rhythm with "breathing" rhythm of 50 cycles or astronomical earth movement.